On May 17, 2018, Sagenhaft Gryphon Von Drakkenfels (Gryphon) received the Einstein Award for Outstanding Rottweiler Ambassador Award. This award, offered by Dede & Mark Brownstein, is presented posthumously to a deserving canine candidate who died in the calendar year prior to the National Specialty and who was distinguished in the area of therapy, rescue, or education. Gryphon excelled as a therapy dog, as an ambassador for his breed, and as a Read With Me dog in educational settings. 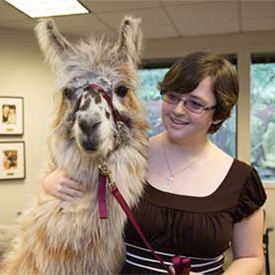 Gryphon and his handler, Cathy Varidel, were a registered Pet Partners therapy animal team working with local group Compassionate Paws, Inc. in Rome, GA for seven years. Gryphon was involved in the Read With Me program for several years and had schoolchildren read to him on a weekly basis. He had four regular students who read to him for an entire year to help improve their literacy skills. Gryphon was very good with children and the children migrated to him. When two of the teachers were killed in an accident, Cathy and Gryphon were at the school to comfort the grieving children when they returned to school after their loss. In addition to participating in reading programs, Gryphon went to colleges and universities to help students de-stress during final exams. He left his mark on the community through frequent library visits and appearances at community events for the National Alliance for Mental Health, Grands Who Care, Berry College students, and the local St. Patrick’s Day celebration. Gryphon also visited healthcare facilities including hospice, nursing homes, and hospitals. Gryphon was a gem of a dog. He had a big heart and a gentle spirit and was loved by all who met him. One immediately felt safe in Gryphon’s presence. He was the go-to neutral dog when Compassionate Paws held Pet Partners team evaluation events. 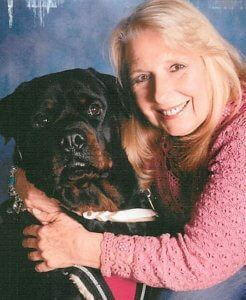 He was the first Rottweiler to receive the AKC Distinguished Therapy Dog Title. Gryphon seemed to know what to do to comfort people. Gryphon’s life was too short; he died from cancer on November 14, 2017. He has been grieved and remembered by many for the comfort and support he brought to countless people during his time as a therapy dog.